Rethinking Your Flight Plan #infographic ~ Visualistan '+g+"
Nearly 30,000 planes safely navigate the United States airspace daily. It isn't sheer luck that's keeping our skies friendly - it's a highly complex system know as Air Traffic Control (ATC), designed to monitor and manage the countless moving elements to ensure the safety of all passengers and air crafts. Proper visibility and communication are key components keeping air travelers from potential disaster. 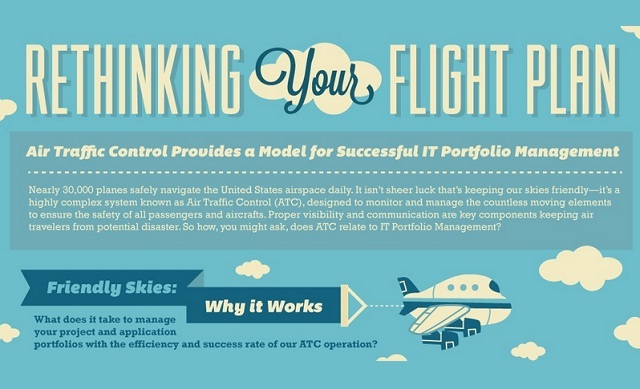 So how, you might ask, does ATC relate to IT Portfolio Management?